It’s a bird, it’s a plane, it’s….THE POPE! You know when you have one of those days where you have a ton of things to do, but don’t feel like doing anything at all? I’m having one of those…weeks. I’ve been getting up early (ahem, before 10 am , I know my life is so great, right? Tell that to my hands that still smell like toxic chemicals from cleaning the bathroom), yet I seem to actually do less. So I’ve been meaning squeeze in writing a post among the ton of things on my list, but hadn’t gotten around to it. Plus, I was a little indecisive as to what to write. 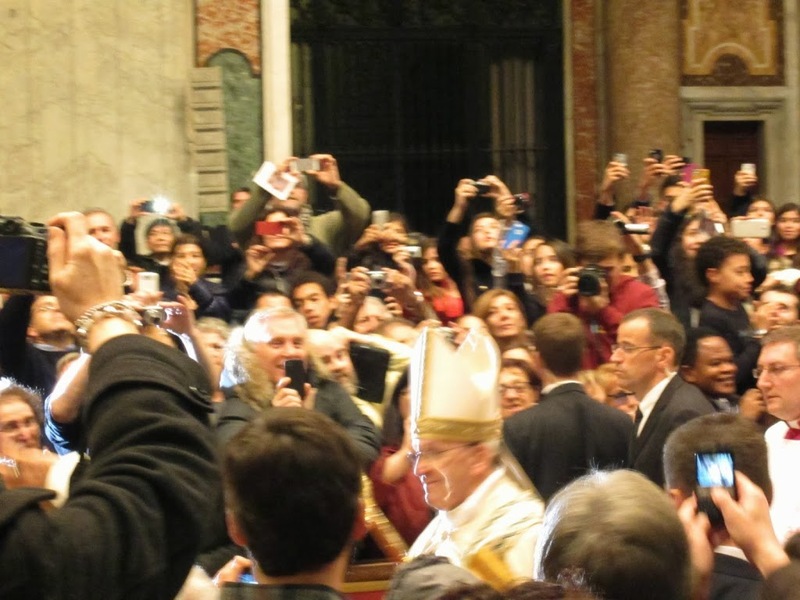 But I figure now is as good a time as any to write about the two times we’ve seen the Pope, especially since one of the times was on New Years Eve and I think it’s a little weird to write about what we did on NYE anytime after January. Obviously, by seeing the pope I mean he was there, about 100 feet away. Or passing by us on the way to the altar. But hey, that counts right? 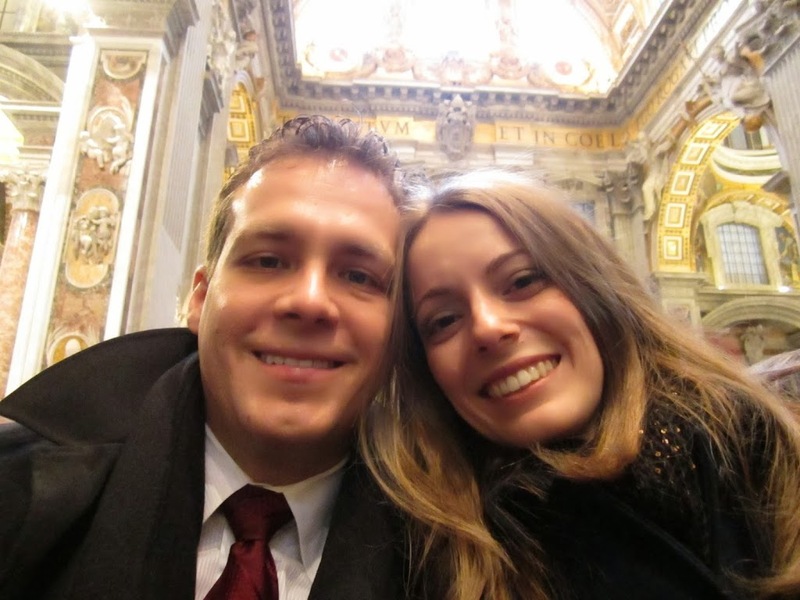 The first time was a few months ago (we’ve been in Italy so long that I can say a few months ago and I’m still talking about events that happened since we’ve been here! dhgfskjfhkdjfhdk), when I was in my “anytime-before-noon-is-too-early” stage and Jaime dragged me out of bed on a Sunday to go to St. Peter’s Square. 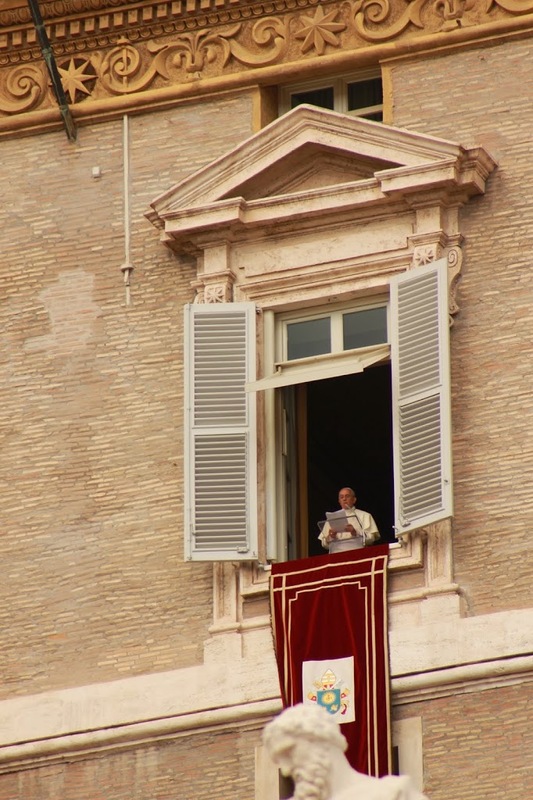 Every Sunday (except some Sundays in the summer, I believe), at noon, the Pope gives an address from his window and recites the Angelus, a devotion in memory of the Incarnation (thanks, Wikipedia!). Now I’ll admit that part of the reason I was excited about going was actually to go to this AWESOME bakery about 5 blocks from the Vatican (check out it’s Yelp page), but it was actually kind of exciting to be waiting there among such a huge crowd for this little tiny person to show up at his window. It’s a cool thing to do if you’re ever in Rome on a Sunday, since I suspect not every tourist can claim to seeing the pope. The second time we saw the Pope is a much more interesting story to tell because we actually got to go to the New Years Eve mass at 5:00 pm! Now I’m not going to lie, I don’t have a super long story about the odyssey it was to get the tickets because we were hooked up, no tears, sweat, or sacrifice of a first born necessary. But there’s about a million articles online about how to get tickets and the Vatican website is probably a good place to start. In fact, I have a feeling that for a lot of events with the Church, the trick is to pretty much just ask, even if you think you don’t have a one in a million chance of getting it. Also worst comes to worst, you can always show up on the day of a mass and try to find some priest or nun with extra tickets. There was one in front of us in line giving some away, but I digress. What people don’t talk about online, at least that I could find, is what to do after you manage to get your hands on a ticket. Like how early to show up or what to wear and how to act. So I’m here to give you all the information you need to know. 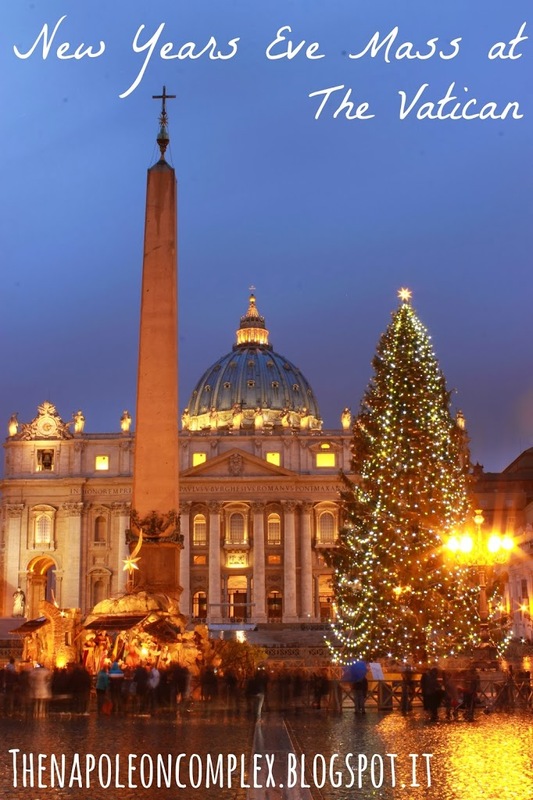 Beautiful Picture of the Christmas Tree at the Vatican. I don’t know if this just happens to me, but I always seem to have an issue with what to wear to church. In Ohio, people showed up to Sunday mass in tshirts, soccer practice gear, or sweatpants and I always found that just a tad inappropriate. In Miami, people aren’t quite so informal, but sleeveless shirts are completely acceptable. Sandals too. Washington, was perhaps the most formal place I had been to mass. But Italy is a whole other ballgame. Every church has a dress code, meaning no shoulders or knees showing or you won’t be allowed in. 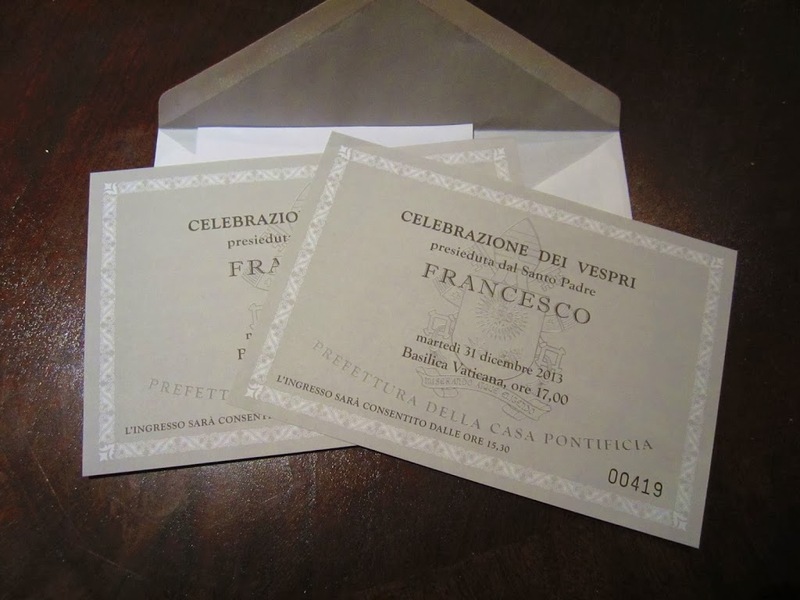 So you think, New Years Eve + Vatican Mass = Bring out the tuxes and the red carpet dresses! I wore a nice long-sleeved shirt, a black skirt (above the knee, but with stockings under which begged the discussion between Jaime and I, are stockings technically considered coverage for the knee?) and a long Navy coat over everything. I also wore my high HIGH heeled boots, as opposed to my high heeled boots. Jaime went all out with a suit and tie and nice shoes and everything. Long story short, we were overdressed. Sure, the dress code still stands, but I think it’s a lot easier to be in dress code during the winter anyway, when you have to have every inch of your skin covered. Other than that, everyone was in jeans, comfortable walking shoes, with book bags. Jaime didn’t even bring his beloved camera just so that he wouldn’t look stupid in a suit with a camera bag! And it was all completely unnecessary frankly. I was told by one of our friends that have been to this mass before that the earlier you get there, the better, because even though you have tickets, it doesn’t necessarily guarantee you a seat inside St. Peter’s Basilica. I cannot attest to the validity of this because we arrived two hours before and managed to sit inside just fine. At least on New Years Eve, the Vatican closed St. Peter’s Square at noon completely, then reopened it at 3:30 for everybody, with or without tickets. 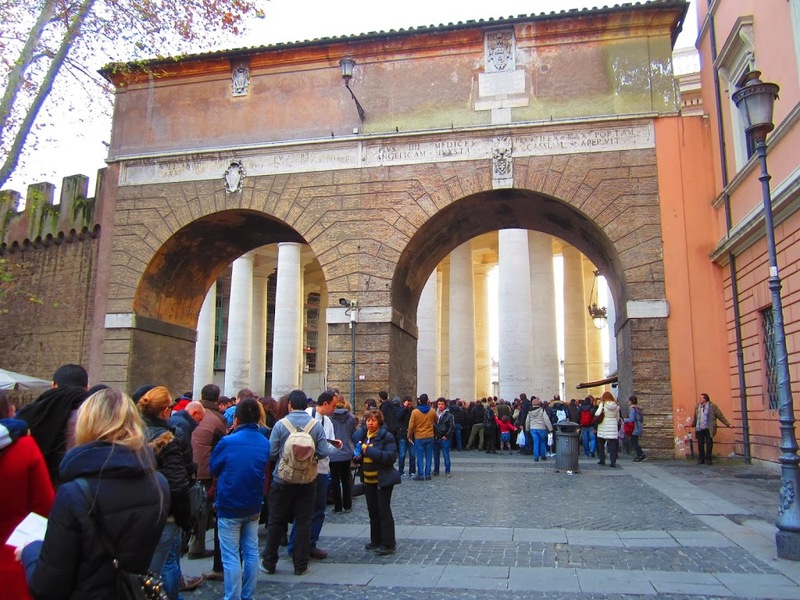 The people with tickets could then proceed to stampede, Hunger Games style, into the Basilica as if it was the Cornucopia with only one bow and arrow. Yes, that is exactly how it happens. I thought it was completely unorganized. Up until 3:30, you stand in these lines outside that have no rhyme or reason to them, watch as confused and not-so-confused people ask and skip to get as close to the security gates as possible. We asked POLICE OFFICERS monitoring the lines if that was were we were supposed to line up and they had no clue! But yes, once you get there, find a line somewhere and just wait. As soon as they open the gates and start letting people pass through security, that’s when the real fun begins. Basically, the line goes to hell and people just push their way to the front, until they are lucky enough to get through the little opening. It’s kind of like the scenes in the Titanic when the ship is sinking and people are pushing to get on a lifeboat. Then, once you go through security, you go from being on the Titanic to being in the Hunger Games and run, run, run to the cornucopia, my friends! Once the music starts and the procession begins, everybody stands up, piles up on the aisle seats or stand in their chair to get a picture of the pope (who is tiny by the way). It was basically like a basketball game. Definitely not a religious ceremony. The worst part was that it’s not just tourists who may or may not be Catholic. I literally had an Italian lady that was supposed to be three seats down from me stand next to me the whole time trying to get a picture of the pope. I don’t know, but for people that are constantly monitoring whether your knees are covered, I think they should have had the same dedication for the way people were acting inside a church during a ceremony. As for the mass, it wasn’t an actual mass in the traditional sense of the word, since we didn’t read three readings or take Communion. It was basically a ceremony with a lot of beautiful singing by the chorus, and a few words by the Pope. But he wasn’t really leading the ceremony, either. And unless you are sitting in the front of have a huge camera with great zoom, you will only hear the Pope, not see him. I got one as he was on the way out! But hey, at least we get to say we were there and have the tickets to prove it!